Shimla : While addressing public meeting at Devthi in Rampur Sub-division of district Shimla, late Sunday evening, Chief Minister Virbhadra Singh said that the government was committed to improve the road condition and provide connectivity to every village of the State, particularly in remote areas as roads were the lifeline of any state or nation and were harbingers of development. He said that all the census villages in the State has been provided electricity and today there were 91 degree colleges in the State and the State government during last two and half years of its regime had opened as many as 22 degree colleges. Besides, the already existing two medical colleges and hospitals in the State, the government had been successful in opening three more medical colleges in the State and AIIMS at Bilaspur, Indian Institute of Management at Dhaulakuan in Sirmaur district. He said that education was a key to knowledge and knowledge was a path towards both physical and mental development of an individual thus leading to development of any State. The Chief Minister said that building of engineering college at Kotla in Sarahan would soon be constructed so that the classes could be started in Kotla itself which at present were being held in Sundernagar. 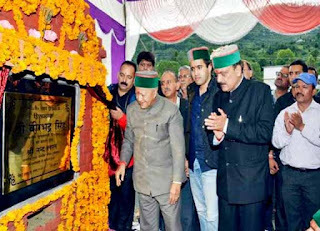 Virbhadra Singh said that it was the Congress government in the State which made trusts for smooth functioning of shrines and temples. He urged people to protect their religious places and also to conserve culture and customs for future generations. The Chief Minister announced upgradation of Veterinary dispensary to Veterinary hospital at Devthi, starting of science classes and constructing science block in GSSS Devthi and Construction of play field for the children at Devthi. Chief Parliamentary Secretary, Nand Lal welcomed the Chief Minister to his home segment and thanked him for dedicating development projects and performing foundation stones worth Rs. 70 crore in his two days visit to Rampur sub division. He thanked the Chief Minister for directing the reconstruction of Sharai Koti temple on which around Rs. 80 lakhs would be spent. He also thanked the Chief Minister for directing the PWD authorities for metalling Daranghati to Goddess Sharai Koti temple road. He listed other development works undertaken in the area and advocated to fulfil the demands as laid down by up-pradhan of Devthi. Nand Lal also urged the Chief Minister for considering rope-way project from Devthi till the temple of Goddess Sharai Koti and helipad at Majhali. Vice President of Devthi Panchayat, Rajnish Kayath welcomed the Chief Minister and demanded opening of branch of any Nationalised bank in Devthi, upgradation of Veterinary dispensary to Veterinary hospital at Devthi, starting of science classes in GSSS Devthi, besides constructing play field for the children etc. The local panchayat representatives of Devthi and nearby Panchayats and President, Temple Committee Devthi, Bihari Lal honoured and welcomed the Chief Minister.